The worshipful Society of Apothecaries's Hall is filled with rhinoceros, but why? It's probably one of the most famous and certainly one of the most influential images of an exotic animal to be made. Towards the end of 1515 Manuel I of Portugal sent an Indian rhinoceros as a present to Pope Leo X. Private menageries housing exotic animals were popular in aristocratic circles in Europe in C15th & C16th. 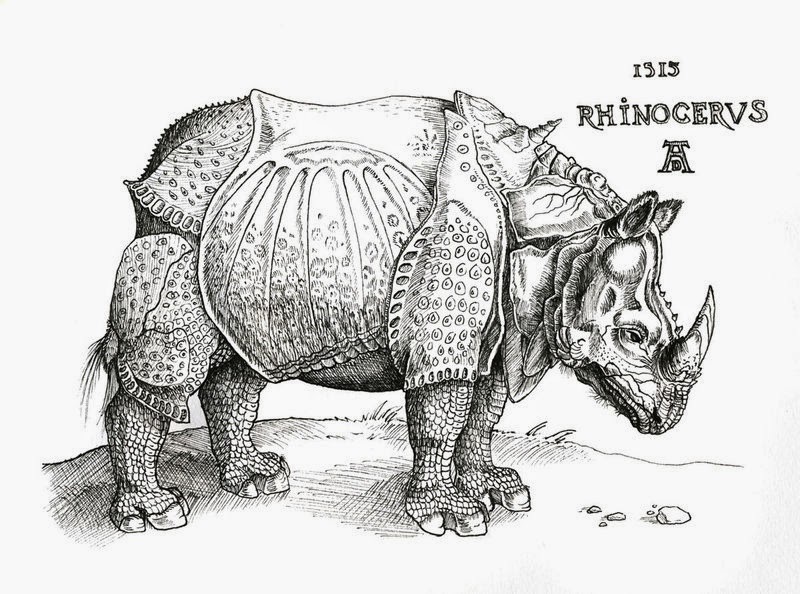 Durer drew a rhinoceros without having seen one. He used a description and a living sketch of a friend in Lisbon, Portugal who had seen animal. Impressed by the account of the creature's thick hide described at the colour of a speckled turtle Durer has given his rhinoceros skin that looks like a turtle shell or a suit of armour. To make the animal look more exotic and durable, Durer has covered its legs with with scales and has added an extra twisted horn at the base of its neck. Pliny the Elder, a Roman Commentator wrote the inscription at the top explaining that rhinos and elephants were thought to be mortal enemies and that rhinos are so well armed that elephants could do them no harm. Durer sketched an Indian rhinoceros whose name was 'Gonda', which would have only had one horn. However, Europeans at the time would have been more familiar with the two-horned African variety familiar to the ancients. Durer's woodcut was printed in large numbers and became the archetypal for a rhinoceros for more than a century. In C16th & C17th, when educated Europeans thought of a rhinoceros it would have been Durer's image they would have based their own thoughts upon. A rhinoceros forms the crest of the Society of Apothecaries, whose powdered horn was alleged to have numerous medical properties.